17% rise in revenue for 3rd quarter from 471.10 million to 549.10 Million whereas total revenue for 9 months was Rs 1246 million which is an improvement of 30% YOY. EBITDA for Q3 increased by 22% to Rs. 96.3 Mllion and on YOY it grew by 28% to 254.2 million. Standalone net worth as on 31st December was 1925.5 million. Standalone debt was Rs 1557.5 million while cash at bank stood at Rs. 37.9 million. Debt to equity ratio was a healthy 0.79 and company’s efforts are to keep it below 1 at all times. The changing assignment and allocation of projects is the reason why operating cash flows are negative. Inclusion of affordable housing in infrastructure and more allocation to Pradhan Mantri Griha Awaas Yojana by the Government, is set to benefit Nila as they are an established and registered player in government’s affordable housing space. 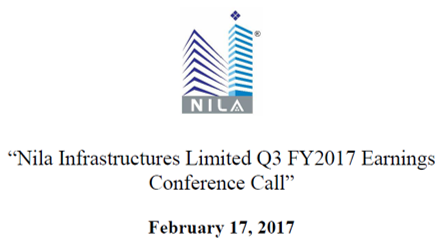 Nila infra has already delivered 2,300 units i.e. 13 lakhs square feet of construction to government under affordable housing. 55% of total order book consists of affordable housing projects of the government. Well diversified order book with EPC, EPC+PPP and PPP projects. Margins for projects: EPC: 11-12%; EPC+PPP: 14-16% and PPP: 18-20%. Total confirmed unexecuted order book as on 31st December is 3013.70 Million of which 55% is in affordable housing and 45% from civic urban infra. Margins expected to improve with an increased proportion of PPP projects in order book as they are high risk high return. Land bank of Rs. 70 to 80 crores exists with the company.